Countless alien insect species have been introduced to British Columbia. These introductions can be benign, it may take decades for the effects of these introductions to appear, or the impacts of these invasive pests can be immediate and drastic. Although we are more aware of the need to prevent the introduction of new pest species, the increasingly global nature of our economy makes this task more challenging. The pests fruit tree growers were confronted with fifty or one-hundred years ago are different from the pests growers must deal with today. The list of pests challenging growers will surely change in the future. Here are a few pests growers should be on the lookout for. Stink Bugs are named for the distinctive, pungent odor they produce. This stink is believed to discourage predators from eating these bugs. There are many species of stink bugs native to B.C., and most are harmless while some are even beneficial to fruit growers. The brown marmorated stink bug (Halyomorpha halys), however, is not native to Canada and poses a major threat to agriculture in the Okanagan. 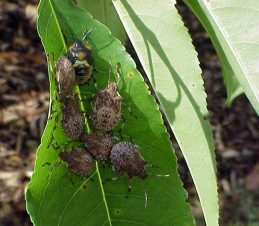 The brown marmorated stink bug attacks 80 different plants including tree fruits, berries, grapes, vegetables, corn and ornamental plants. Adults and nymphs feed by piercing fruit, vegetables and leaves with their sucker-like mouth parts. This feeding causes small dead spots on the fruit and vegetables, making them unmarketable. The brown marmorated stink bug was first identified in the Eastern United States in 1996. By 2010, it caused an estimated 37 million dollars damage to the apple industry there. Since then it has spread to Washington and California. The brown marmorated stink bug is about the size of a dime and has a mottled brown and white colour. It can be distinguished from other stink bugs by the brown and white stripes on its antennae and alternating light and dark bands along the margins of its backside. 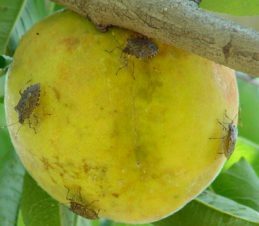 The best way to prevent the spread of the brown marmorated stink bug is to not bring fruits or vegetables from other countries or the United States into B.C. The pest is currently not in B.C. Growers and home owners are asked to report any suspected brown marmorated stink bugs to the B.C. Ministry of Agriculture. The Oriental Fruit Moth (Grapholitha molestaI) is a close relative of the codling moth and feeds primarily on peaches and nectarines; however, it will also attack apple, pear, quince and other stone fruit in the vicinity of peaches. British Columbia is the only region of North America where peaches are grown commercially that is free of this pest. This pest was detected in B.C. in 1957 and eradicated at great expense three years later. The Canadian Food Inspection Agency conducts annual surveys for the oriental fruit moth. The oriental fruit moth is 5 mm (1/4 inch) long and has a salt and pepper appearance. It may have 4 to 6 generations a year, depending on the weather. The first generations of the season tunnel into new shoots, causing the terminal branches to be limp and have wilted leaves. Later generation moths will tunnel into fruit. 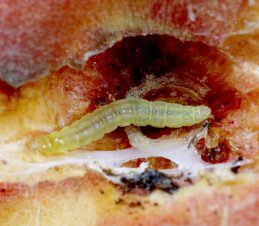 Apples infested by the oriental fruit moth look similar to those infested by the codling moth; however, tunnels of the oriental fruit moth are smaller and meandering, rather than going directly to the core of the fruit.